We’d love your help. Let us know what’s wrong with this preview of Vimanarama by Grant Morrison. Feel the Earth tremble as 19-year-old grocer's son Ali From the fertile mind and nimble fingers of writer Grant Morrison and artist Philip Bond comes the latest in multiculturalist spectacle! Color, song and cosmic violence collide in VIMANARAMA, collecting the 3-issue Vertigo miniseries that fuses East and West together into a transcendental delight of romance and danger. To ask other readers questions about Vimanarama, please sign up. 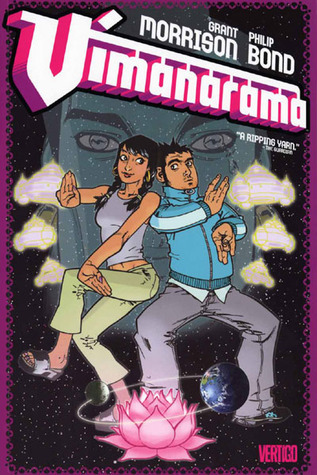 Vimanarama is Grant Morrison's bizarre-o take on a modern day apocalyptic tale set in England with a definitely Eastern religion influenced veneer. Starts off predictably enough with the appearance (presumably enough) of a Bollywood flick. In similar fashion the story careens forth with all the color and bombasity such a film would entail. The initially believable plot swiftly alters from the profane toward the cosmic. Humongous nephilim-esque figures quickly take the fore after their foil bad gu Vimanarama is Grant Morrison's bizarre-o take on a modern day apocalyptic tale set in England with a definitely Eastern religion influenced veneer. Humongous nephilim-esque figures quickly take the fore after their foil bad guys (who look like Darkseid with tuning forks for horns) are reborn as well. The protagonist's personal problems are subsumed by a crisis of cosmic proportions. Toss in the Legend of Atlantis and a pre-modern space station and the story just gets more and more bizarre. The application of Hindu ethos/beliefs becomes all the more bizarre (as revealed in the final issue) that the family is Muslim. No matter the slightest shred of logic, Morrison (with his penchant for the heavenly) tosses us a truncheon of Orientalized glints and glimmers of an Oriental mythos. Truly imaginative in scope, the narrative and the illustrations thinly border on the LSD-influenced psychedelia of the 60's. Messy sure but you can't expect much less from a Morrison work, nonetheless from a one-shot. The three issues will dazzle your eyes but your brain will (uselessly) stretch to make the slightest sense. Who needs substance when you've got groovy style? Ancient Indian space gods return to wreak havoc on London just as Ali, a young British-Indian man, is about to find out what his betrothed wife-to-be will look like. As Ali discovers he is somehow tied into the chaos happening around him, he and his bride-to-be set off on a mystical adventure to save the world! Vimanarama is Grant Morrison writing what he does best - crazy superhero stories with spiritual-ish elements liberally mixed in. It's also a much lighter, funnier story than we usually see Ancient Indian space gods return to wreak havoc on London just as Ali, a young British-Indian man, is about to find out what his betrothed wife-to-be will look like. As Ali discovers he is somehow tied into the chaos happening around him, he and his bride-to-be set off on a mystical adventure to save the world! Vimanarama is Grant Morrison writing what he does best - crazy superhero stories with spiritual-ish elements liberally mixed in. It's also a much lighter, funnier story than we usually see from him and the humour and jokes are the best quality in this book. Philip Bond's artwork is pretty good - I wouldn't say I was blown away by anything I saw but the line work is strong and the designs for the Ultrahadeen (the good Indian space gods) were great even if the bad guys bore a heavy resemblance to Kirby's Darkseid. Weird and fast, though not really fleshed out, still enjoyable for what it was. One of the three 3-issue Vertigo mini-series from the mid-2000's by Grant Morrison (the other 2 being the equally excellent We3 and Seaguy), Vimanarama is a wonderful blend of East & West, of comedy & drama, and of light & darkness. Don't let the 'potential End of the World' storyline fool you: this book is a light-hearted break from all of Morrison's serious/edgy/WTF stuff, with endearing characters and colourful, eye-popping art. I liked how some (if not all) of the characters were more concerned with their own problems than with the impending destruction of the world. The only thing I regret is that it took me so long to actually get around to reading it! The fact that it's out of print* certainly makes finding a copy that much harder, but should you have the chance to read this book, don't pass it up. Fun, charming, witty, colourful. Comic book gold. A surprisingly funny entry from Morrison, who I've never really seen do anything bordering on "comedy" with any success. This still has a lot of his specific creativity behind it (big crazy gods, different realities colliding, exploration of death and emotion via extremely weird metaphors), but somehow feels different from his other stuff I've read. Part of it is the characterizations. Morrison often just kind of makes everyone in his books extremely weird, and in this case we've got some real li A surprisingly funny entry from Morrison, who I've never really seen do anything bordering on "comedy" with any success. This still has a lot of his specific creativity behind it (big crazy gods, different realities colliding, exploration of death and emotion via extremely weird metaphors), but somehow feels different from his other stuff I've read. Part of it is the characterizations. Morrison often just kind of makes everyone in his books extremely weird, and in this case we've got some real life human beings on the page. This is actually great, and really grounds the book when it needs it. Philip Bond's art is also a great fit for this style, and brings the whole story to life in amazing ways. Grafisch und erzählersch auf hohem Niveau, nur die Geschichte hat mich nicht interessiert ... von den Charakteren ganz zu schweigen. I'm trying to figure out where this fits in on the Grant Morrison scoring chart. Essentially, it's fine - fairly amusing, some good character interactions (particularly between Ali, his brother and their father) and great visuals. A short, diverting read. But the plot just feels rushed and half-baked, and that really rankles with me for some reason. It's like Morrison lost interest in it halfway through. Possibly sooner. Lots of cosmic out-thereness to camouflage the lack of coherence. A deus ex I'm trying to figure out where this fits in on the Grant Morrison scoring chart. Essentially, it's fine - fairly amusing, some good character interactions (particularly between Ali, his brother and their father) and great visuals. A short, diverting read. But the plot just feels rushed and half-baked, and that really rankles with me for some reason. It's like Morrison lost interest in it halfway through. Possibly sooner. Lots of cosmic out-thereness to camouflage the lack of coherence. A deus ex machina here (but the actual mechanics of the story were so confused it's not even clear that it was necessary), a Morrisonesque breaking of the fourth wall there (ditto - to be uncharitable Morrison is papering over the obvious cracks with a veneer of his go-to tricks, in an effort to distract us); but you're left scrabbling to find the sum of its parts. The Indian/Pakistani background quickly becomes superfluous to the story (again to be uncharitable, the main relevance seems to be that the family owns a corner shop), which is fine, except that such a lot is made of the background in the packaging of the book. And there's a very odd blend of Hindu and Muslim cultures used in the book. Its name, the font used in its logo, the poses of the characters on the cover, the demigods (the Ultrahadeen) are all rooted in Hindu culture (i.e., a culture which is predominantly Indian); but the characters are of Pakistani origin and are Muslim. There's no reason why these two different cultures couldn't be utilised in the same book, but there is no reason in this book why they are. They are presented here without distinction, which just seems lazy. The best thing about the book is Philip Bond's charming art - for that alone the book probably deserves 3 stars. I would like to read a story illustrated by Bond, with the same characters, but without all the mythic, supernatural and superheroic elements. While he does carry off the Demigods, battleships, demons etc. just fine, it's in the smaller things that his art really comes to life. So on the Morrison scale of things - the book is short (generally a good sign for a Morrison work); it has few pretensions, and is not trying to carry A Bigger Message (again, normally in its favour); unfortunately, through lack of time or interest, Morrison didn't seem to care enough about the story to make it cohere (kinda fatal in the Morrison canon). And that makes it very minor Morrison - a shame, as Philip Bond (not to mention the readers, and Southern Asian culture as a whole) deserved better. I get the impression that Grant Morrison once read Roger Zelazny's "Lord of Light" and said to himself, "Hey, I could do that...but as a graphic novel." Seriously, this was a frustrating book. Some of it was clever, in the ways that the new Dr. Who is clever...the interactions between the cosmic and the mundane worked well. What didn't work well for me was the main character, who is remarkably self-centered and whiny. The "suicide" sequence, in particular, made too little sense, but the character I get the impression that Grant Morrison once read Roger Zelazny's "Lord of Light" and said to himself, "Hey, I could do that...but as a graphic novel." What didn't work well for me was the main character, who is remarkably self-centered and whiny. The "suicide" sequence, in particular, made too little sense, but the character had a good excuse to be somewhat irrational by then. It had interesting enough characters, but the plot was somewhat less enthralling. Oh, the stuff was there...from the very mundane to the supra-supernatural...but it somehow didn't add up to a full meal. I'm not sure what happened, but Grant Morrison is a much funnier writer than he generally gets credit for being. Lots of great lines in this book had me laughing out loud. The plot seemed to hinge on an Eastern belief system with which I am unfamiliar (religion of any sort not being my forte), but I was able to follow the basics of evil demigods come to destroy humanity easily enough. Fun stuff, although I'm not sure if there were many of Morrison's analogy-laden narratives and ideas beneath the I'm not sure what happened, but Grant Morrison is a much funnier writer than he generally gets credit for being. Lots of great lines in this book had me laughing out loud. The plot seemed to hinge on an Eastern belief system with which I am unfamiliar (religion of any sort not being my forte), but I was able to follow the basics of evil demigods come to destroy humanity easily enough. Probably needed one or two more issues to actually flesh out the characters and make the resolution a bit more... resolved. But still enjoyable. This book was a bit of a hit mess. I did not enjoy it. This could have been fun, given its unique characters and milieu, but I felt it had a serious tone problem when it came to the issue of suicide. Really enjoyed this short graphic novel combining Pakistani England, superheroes. Enjoyed the drawing style. I really want this to be made into a movie, which maybe makes me a terrible person/comic book fan. This has everything a good movie needs--a meet-cute romance, invading aliens/ancients, baby talk, city-destroying action sequences, and a reluctant hero. It's so crammed with Morrison's absurd plotting, and would be well-suited to a movie that smooths Morrison's stylistic rough edges and standard-issue fourth-wall climax. There's nothing wrong with this book, and so much that's awesome about it, inc I really want this to be made into a movie, which maybe makes me a terrible person/comic book fan. This has everything a good movie needs--a meet-cute romance, invading aliens/ancients, baby talk, city-destroying action sequences, and a reluctant hero. It's so crammed with Morrison's absurd plotting, and would be well-suited to a movie that smooths Morrison's stylistic rough edges and standard-issue fourth-wall climax. There's nothing wrong with this book, and so much that's awesome about it, including Bond's funky artwork. There should be more fantasy/superhero books like this one. Morrison's three Vertigo miniseries from a few years ago (this, We3, and Seaguy) need to be remembered as a nice jolt to normal capes and capers. It's especially impressive that Vimanarama and We3 are so easy to read, which is pretty rare in Morrison's comics. I picked up this mini-series out of a dusty back-issue bin at a con a few years back. It's odd. About as odd as you'd expect from a Grant Morrison mini-series published by Vertigo circa 2005. The general idea seems to be to do an overblown Jack Kirby style story, featuring characters out of Eastern religion/mythology. There's a lot of humor and general weirdness to it. The art, by Philip Bond, works well. He handles both the human elements and the super-human overblown stuff equally well. And, wh I picked up this mini-series out of a dusty back-issue bin at a con a few years back. It's odd. About as odd as you'd expect from a Grant Morrison mini-series published by Vertigo circa 2005. The general idea seems to be to do an overblown Jack Kirby style story, featuring characters out of Eastern religion/mythology. There's a lot of humor and general weirdness to it. The art, by Philip Bond, works well. He handles both the human elements and the super-human overblown stuff equally well. And, when the story turns off into the really weird stuff, he does a great job, creating some really fun, original, imagery. Some of the stuff in here is really cool, like the idea that the demonic antagonists were originally buried deep in the Earth in the form of fossil fuels and the implication that they were released, and the Earth made dark in more than one sense, via the Industrial Revolution. But I can't get over the fact that Morrison mixes Islamic and Hinduism elements haphazardly in his attempt to recreate a Jack-Kirby-space-gods sort of vibe. And the ending was completely unsatisfactory. Seven years later, there's something quite charming about this comic, its "Hindu Kirby" hues & "Bollywood Doctor Who" riffs. Ignore the pat resolution and you can almost imagine a world where this might be considered a crucial text in Morrison's canon, rather than dismissed as a slight entertainment. There's more fun in the margins and asides of this "minor work" than most of Morrison's recent output. Philip Bond should draw more comics. WOW! Now I have to reread this, asap. I think when I read Grant Morrison's book Supergods it will make even more sense. Great cartoon art style here from comics artist Philip Bond. How come he don't do more? A very very slight Bollywood remix of old Grant Morrison themes. Underground empires, 4th wall busting, the invisible world of magicks blowing minds, cheap but effective slapstick, and rearranging of face bits. Phillip Bond is always an entertaining artist and there are a few images here that are delicious in their delirium. But this is just too silly and empty a book to recommend. Unique story that jumps right in. Not a whole lot of time to get to know characters, but a great deal of visual noise in the communication of apocalyptic sounds through words and composition, and some unexpected humor. Stellar! Clearly, we need more superheroes from ancient Pakistan. Author Grant Morrison has referred to this as his Jack Kirby take on Hindu gods and big screen action. While its fun, I think the overall story would have been strengthened if more pages had been dedicated to the story.